I love teaching hand-sewing and embroidery! There is something very satisfying about creating art with colored thread. This sampler is an easy and fun way to make 'vintage style' wall art. I have listed all the stitches used on the next picture, with links to stitch instructions. You will have to draw and cut your own mushroom shapes out of felt, I haven't figured out how to do the PDF template thing. This embroidery hoop is 7"
If you are unfamiliar with how to do these stitches, just click the links below. 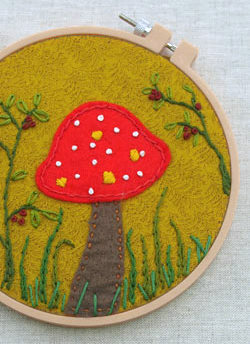 Running Stitch- Attach the mushroom stem first with this stitch. It is a basic in and out stitch. Stem Stitch- This stitch can curve & is used to attach the mushroom cap as well as to create the stems. Satin Stitch- Use the satin stitch to create solid cover. Lazy Daisy- Use the lazy daisy to make flowers or leaves. French Knots- French knots can be tricky to learn, but they are worth it! Be sure to point the needle away from the fabric when you wrap the floss around it. If you point the needle down towards the fabric, and then wrap, the knot will not form.